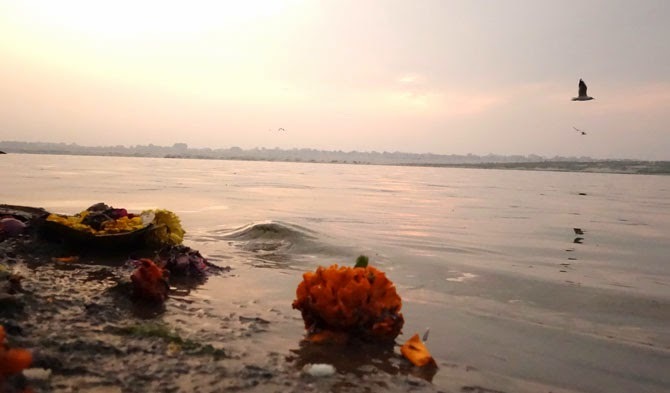 I suspect that for many western travelers coming to Varanasi, they either believe that they have been blessed to come here to experience the sacred Ganges or that they have been cursed to come to such a wild, crazy and chaotic place such as this. Between these two positions there is precious little firm safe ground upon which to stand. Thankfully our lives are not dependent totally upon on our own choices. 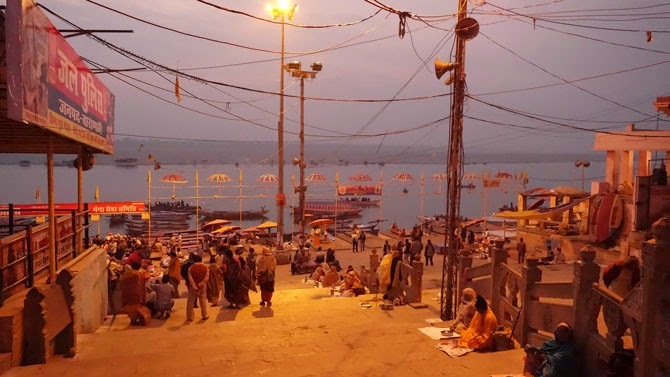 Something within draws us to places such as Varanasi. Something not unconnected to our outer senses but one which draws more upon inner receptivity to our spiritual selves. 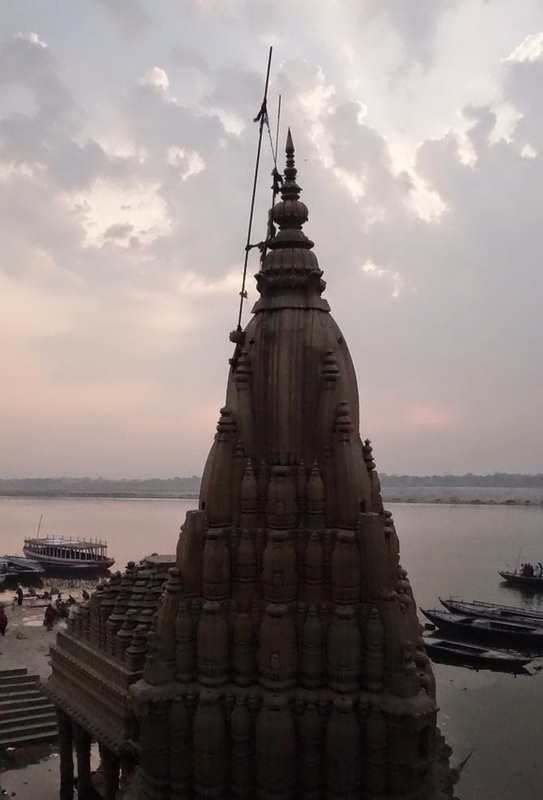 A divinity which is always present within us but which seems to be awakened and inspired by such sacred places like Varanasi caught on a curve of the divine flowing Ganges. There is more dirt and beauty collected in one place than is possible for our human senses to grasp. Indians believe it to be the holiest of its 7 sacred cities. Though it is hard to fully prove it is as well one of the oldest continuously inhabited places on earth. The 10 horse ghat is the focal point for most pilgrims who come to the Ganges. Many take early morning boat rides to enjoy and worship the sun as it rises on the far shore. Agra is one of those rare and unique places in the world that is shaped and defined by one single object. 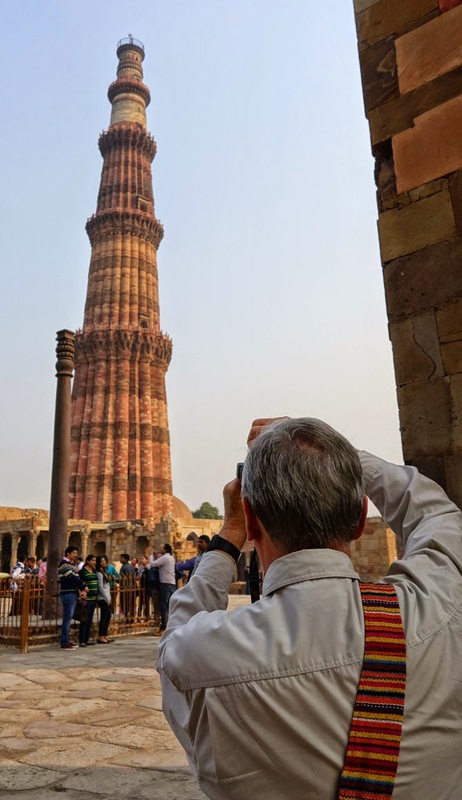 In this case the Taj Mahal is a building of such exquisite beauty that it deserves all the admiration and praise that has been bestowed upon it now for hundreds of years. The Taj Mahal is legitimately possessed by Agra but it is too precious to be the property of just this city of 3.5 million. It instead belongs to the whole world. 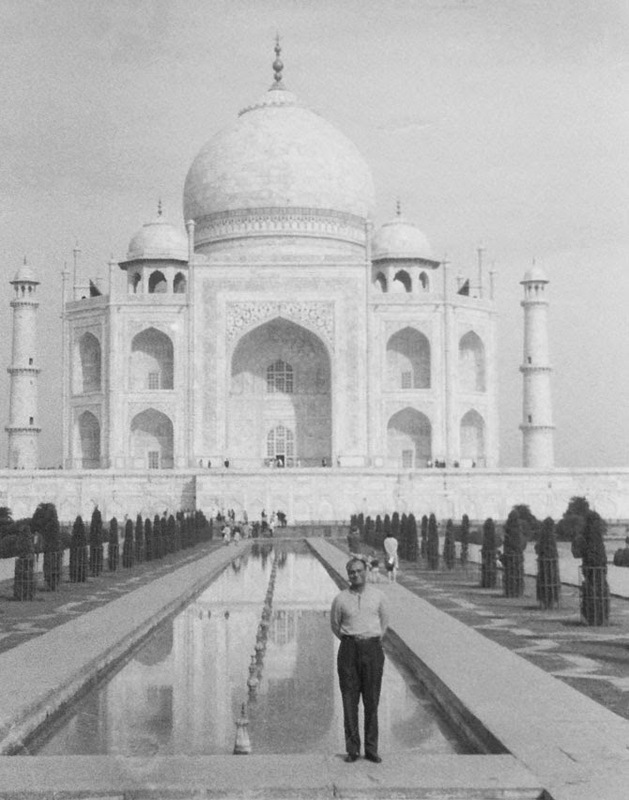 Not too far off is another place whose story is historically and physically linked to that of the Taj Mahal. 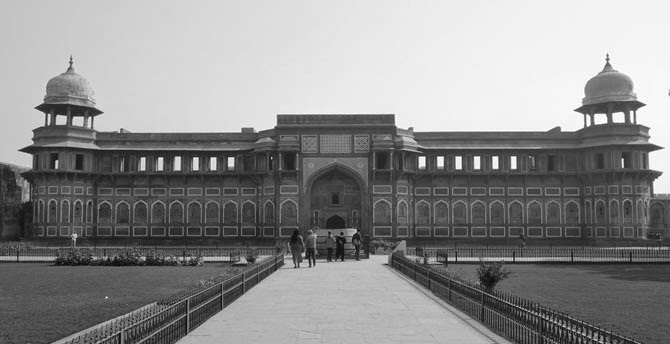 The stories of the Agra fort and its close connection to the other more famous monument are intimately intertwined. In 1558 the Mughal emperor Akbar came to Agra. He needed a new capital that would allow him to rule over his vast kingdom that spread across much of what is now India. 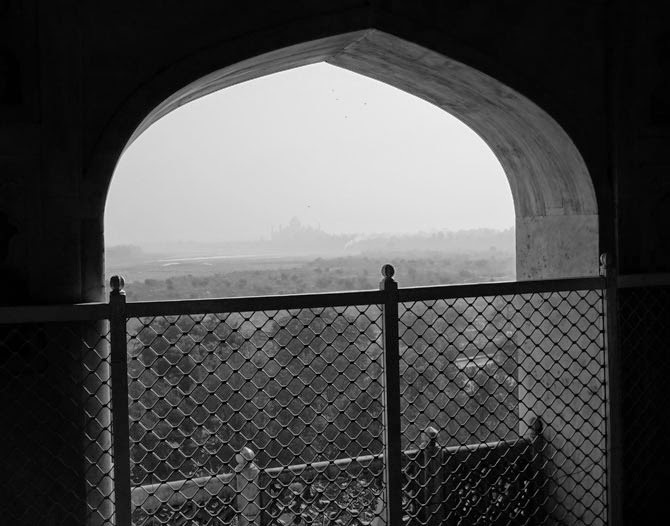 Agra was to be his capital. On top of the ruins of a fort that was already situated here would he build the center of his power in order to reign over his ever increasing empire. 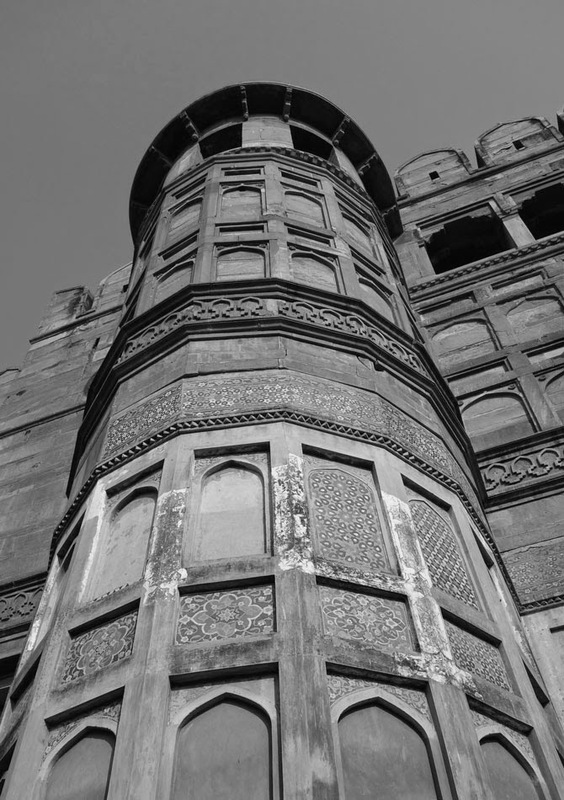 It is said that 4000 men worked for 8 years on building his mighty fort. He wanted it to be a practical and powerful place. He also spared no expense in making it beautiful as well. It is the time of weddings in India. Or at least the time of Hindu weddings. We are told that the season is over by the end of February. Then during the month of March Muslims traditionally get married. We were driving down the road in Agra at night. The bright pool of lights in the distance surprised us as it is mostly very dark on the outskirts of the city where we are staying. 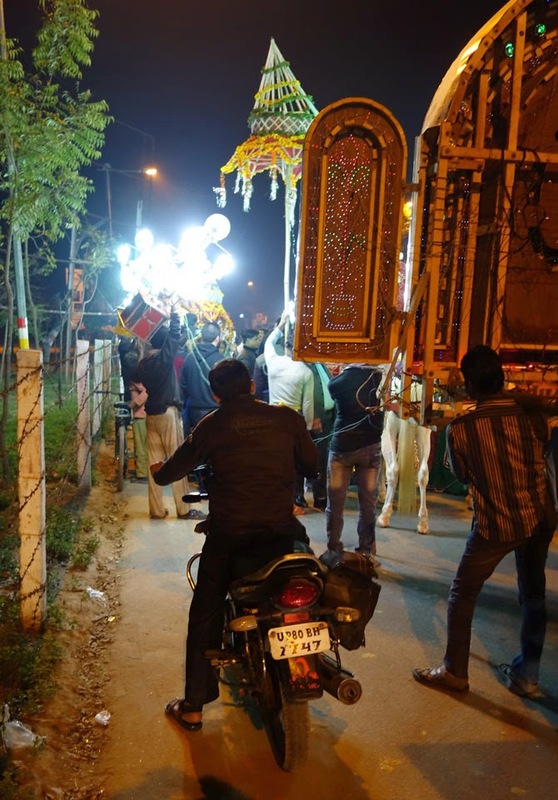 The road is narrow and traffic has to drive carefully around the wedding procession. 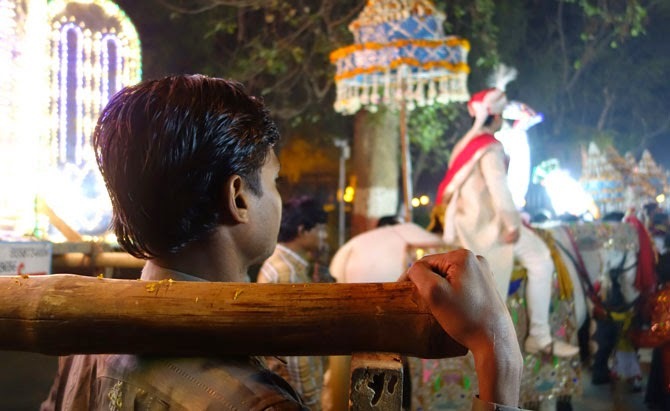 Which besides lights has a band and people dance who dance happily in front of the groom riding a horse. The road out of Delhi was light with traffic while the sky was thick with haze. We were not exactly going to Brindavan but the birthplace of Sri Krishna was not far from where we were staying in Mathura. 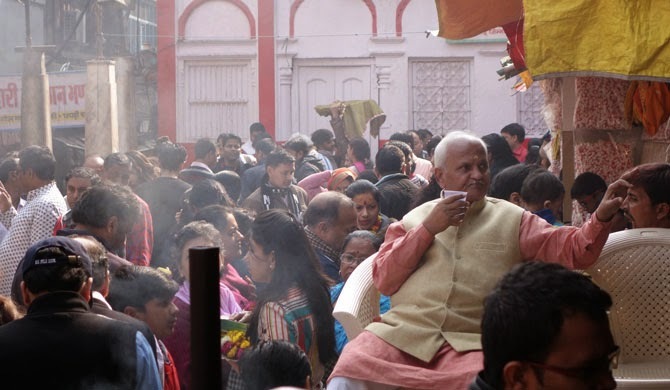 In Mathura there are several important Krishna temples. 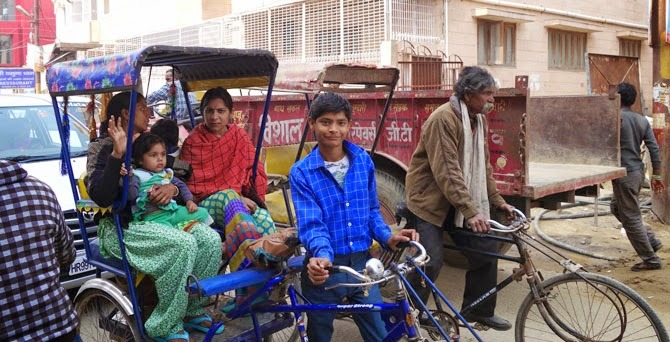 The first destination was Banke Bihari. The driver parked the car as the Sunday crowds filled the road. Sanjaya, myself, and the driver rode in a pedicab to the temple. It is hard to describe the utter outer chaos and yet somehow things still manage to work. Here in this building the shoes are kept by those who don't want to just leave their shoes on the ground. 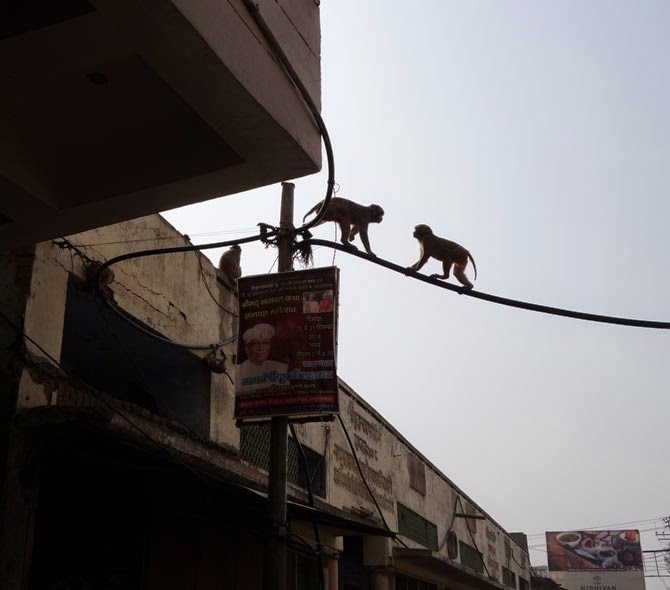 On the way into the temple a large crowd had stopped to watch a monkey, high up on a pole chewing on a man's eye glasses. Shobit Singh is our guide on this Saturday afternoon. 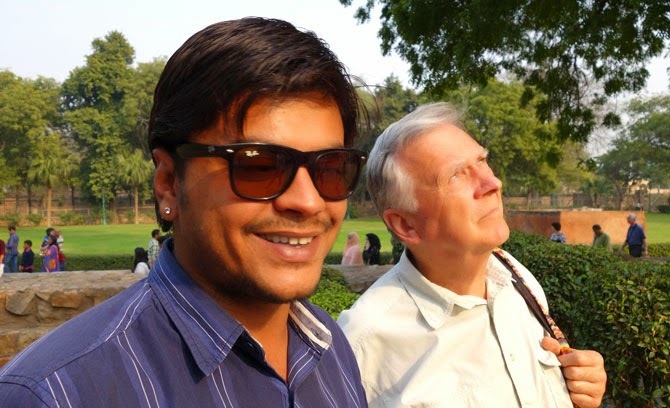 Sanjaya and I have taken the plunge and decided to see the sites of Delhi with as much help as we can. Our plans are ambitious on this election day. The daylight or what remains of it will define much of what happens. The roads are mostly clear but by the time we leave it will be nearly impossible to see all the items on our list. 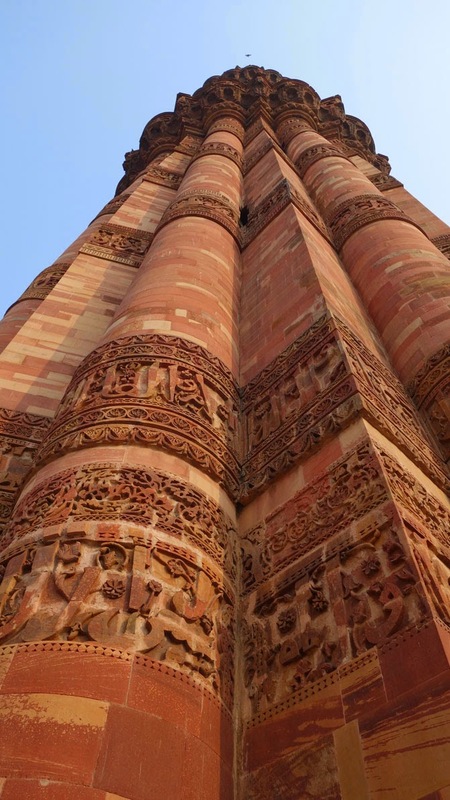 The light is quickly fading when we arrive at the Quatab Minar. It is ancient and it is grand. The warm afternoon light makes its sandstone blocks glow with life. Shobit has many stories to tell about it. More than I can really appreciate. 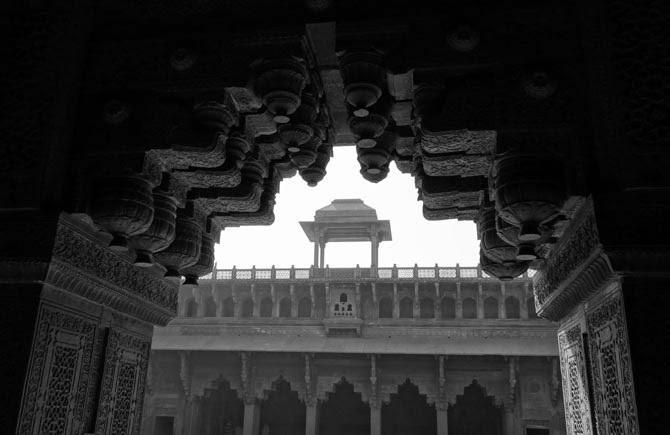 But anything built nearly 1000 years ago has more to say then any young guide from Rajisthan can possibly tell you. It is the time of day I so love most. The promise of sunrise faintly glimmering on the horizon. The atmosphere still and cool though the air of Delhi seems to be permanently tainted by a dull dirty haze. I am staying near Central Park, Or at least New Delhi's version of it. A long steel fence surrounds it and you have to walk some distance to find a gate to let you in. A small group of scruffy man stood next to a little shack. A bedraggled security check point I believe. 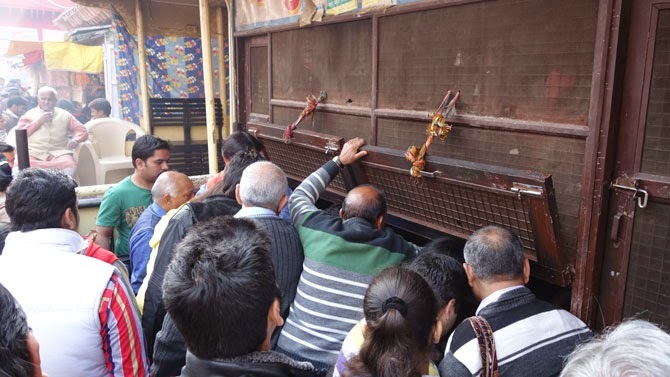 A metal screener stood off to one side ignored by the chatting men wrapped up in shawls. They paid no attention to me as I walked in. Signs said no pictures. A giant Indian flag hangs limp. The wind has yet to rise the city still slumbers. 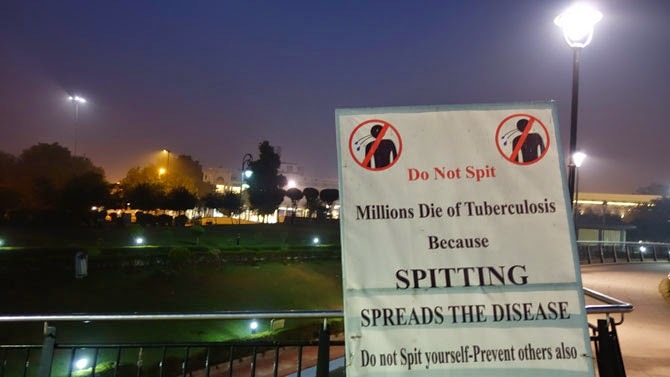 In the middle of the park are many many signs asking park goers not to spit. On the way into the park I could hear the shuffling steps of a man behind me. Then the conspicuous sound of a throat gathering a load of phlegm. Followed immediately by a roaring discharge onto the sidewalk. The peculiar mix of the divine and the worldly I always find mysterious. 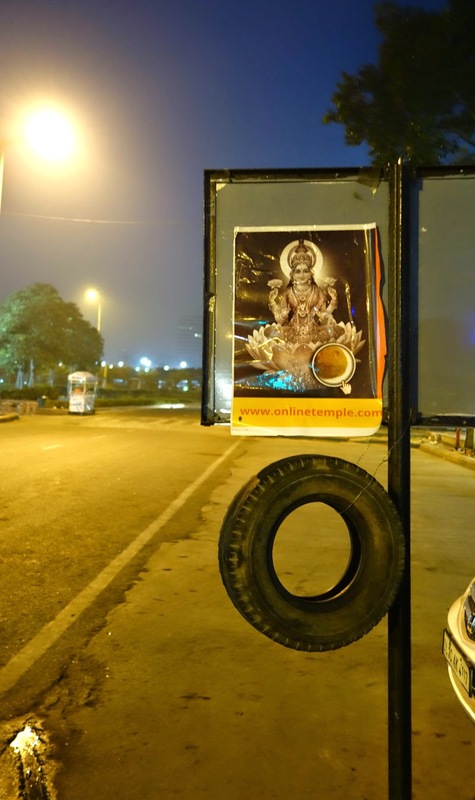 The goddess of beauty Lakshmi juxtaposed with an old hanging tire. 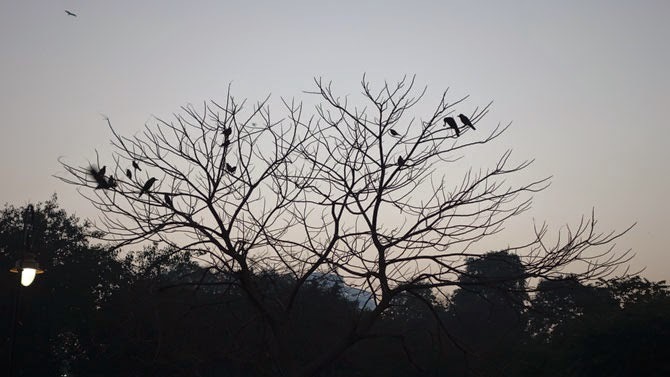 Some of the earliest ones to wake are the crows. Their voices still a little timid in the morning coolness. I learn over my coffee that it is a special day in Delhi. There are I believe municipal elections. The polls are open starting at 8am and close again at 6pm. The television is filled with the excitement of it all. You cannot drink alcohol on a voting day. Security is tightened, or at least so they say across the city. The faces on the screen as sincere and as well meaning as anyone who has ever stood in front of a camera and had important things to say. But just outside the Radisson hotel, security and voting is not so important, or so it would seem. 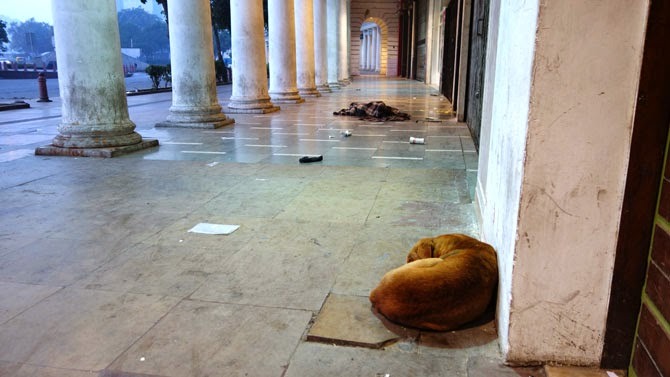 In the still dimness a dog sleeps and a shape lies on the sidewalk under a slim blanket close by. 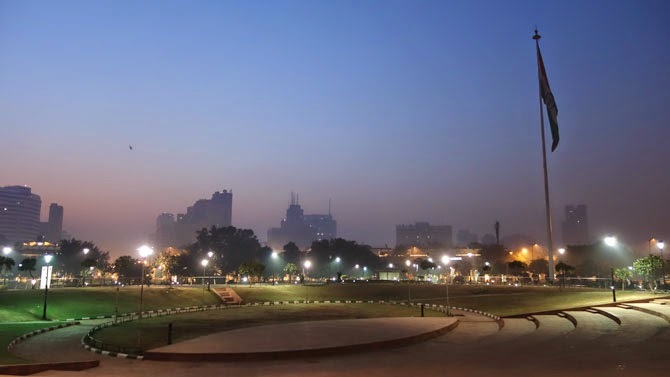 Both beings waiting for the sun to rise and to find purpose on this Saturday morning in Delhi.